Oh my I have finally found the best picture/art and shelf hanging tool!! Have you heard of the Hang-O-Matic? I was contacted thru Instagram to try out this product and it really works! I had my doubts at first, thinking that this was too simple and if it was this easy, why hadn’t this product always been around? Last week I was working on our hall bathroom and had some art to hang, so I thought it would be the perfect time to test it out. I was working on this pretty late at night, so the lighting is a little off in these pictures. 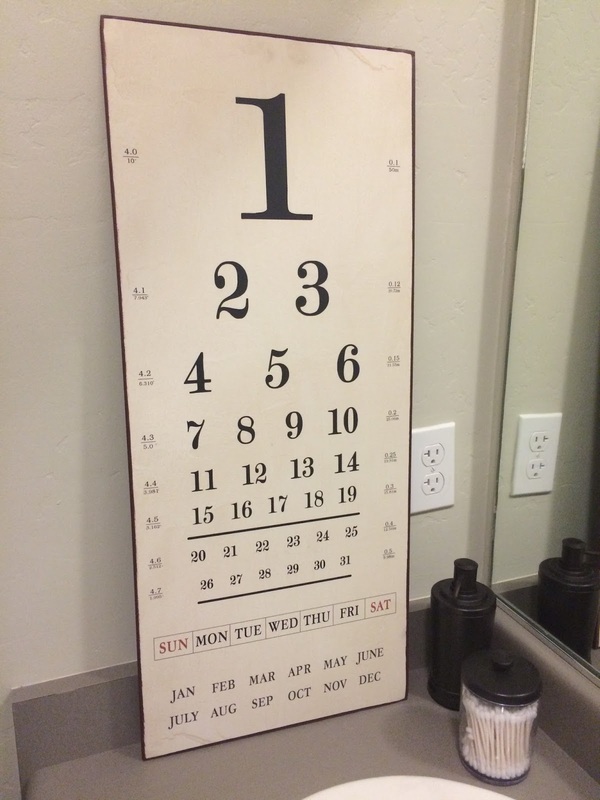 I’ve had this eye chart inspired calendar from Decor Steals for a few weeks now. 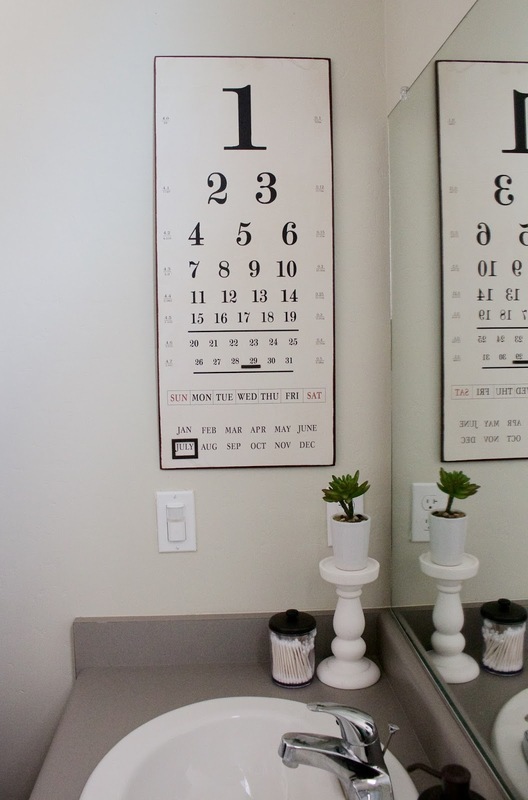 I wasn’t sure where I was going to hang it, but once I started the bathroom makeover I thought a calendar would work great for the small space. Plus, it is longer than it is wide, and fills up the space nicely. First I measured the distance between the two hooks attached to the back of the calendar. Then on the wall, I used the level to make sure it was straight, and pushed on the black metal pieces to make a mark on the wall. It was hard to do this and take a picture at the same time. Luckily, there is a Hang-O-Matic video that better explains the process. After you make the mark, you are left with a tiny hole and this is where you put your nail. I nailed in my nails like normal and hung the calendar. I waited until morning to take a better photo. It worked perfectly and I hung the art in less than two minutes. Before, I would of needed measuring tape, a level, and a pencil but with the Hang-O-Matic I didn’t need any of those other items. The Hang-O-Matic is three tools in one and makes hanging items so much easier!!! You can order your Hang-O-Matic for only $14.95. I will be posting more bathroom updates later in the week. I’ve been working away in our master bathroom too and can’t wait to share!Hang-O-Matic contacted me to try their product for free and share my experience. All opinions above are my own and my honest feedback of the product and brand. Cute art! 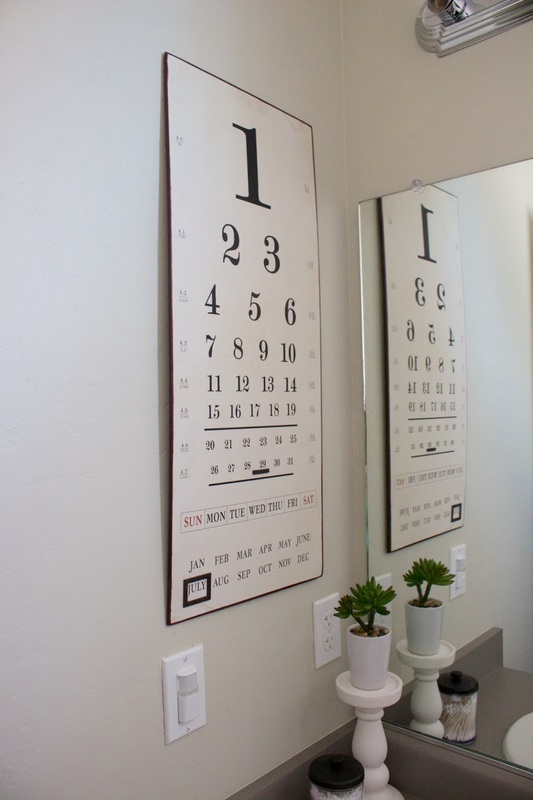 I can see my kids doing an eye test each morning with that! Totally brilliant!! I've hung so many picture frames since I've got it! It would make a gallery wall so much easier!